This Brooklyn band is a real hoot. A curious and original mix of power pop and garage rock, with nasal vocals halfway between Bob Dylan and Lou Reed and a Velvet Underground vibe in songs like “Anna Anna Anna,” Retrospectro represents creative New York City at its snottiest. Backing up their simple yet satisfyingly twisted songs are humming layers of acoustic and electric guitars with an element of trance, along with subtle surf licks and organ chords – familiar parts, with recognizable bits of sixties, seventies and nineties styles, making up an altogether fresh sound. “Sleepwalking” and “Rapid,” which open the CD, are especially catchy. “Peace and Love” and “Anna Anna Anna” are also very good songs, and I liked the closer, “Take It Or Leave It.” The remaining three are weaker. But there’s a lot to like in any handful of this music. Listen and buy at CD Baby. Mala Waldron‘s cool, sophisticated work is just the sort of thing that could nudge jazz closer to the mainstream. With hummable melodies, grown-up but accessible chord changes, and a weave of smooth R&B flavor (especially in songs like the ballad “Because Of You” and the up-tempo “Maybe It’s Not So”), some of these tracks should by all rights find a home anywhere that plays the lightweight likes of Alicia Keys. Yet even the smoothest of these tracks, though eminently CD-101-worthy, are real jazz. That, and Waldron’s superior keyboard skills, should be no surprise considering she’s the daughter of jazz legend Mal Waldron. One of the elder Waldron’s claims to fame was his association with Billie Holliday, and Waldron fille is a supple, fanciful singer who makes everything sound easy. Jazz vocals generally aren’t my favorite corner of the music universe, but Waldron’s are dead-on in tune, pleasingly shaded, easygoing, neither cloying nor precious. Waldron wrote all the tracks except one, and it’s clear she has a finely calibrated sense of what kind of material is ideal for her voice, although one gets the feeling she could credibly sing, and certainly play, almost anything. Even the fluffy lyrics aren’t bad – and “not bad” is pretty damn good for jazz lyrics. Finally, her imaginative, funky version of The Doors’ “Light My Fire” demonstrates her ability to make unexpected material her own. If I had to pick a favorite track, it would be the impassioned ballad “Proud Lion,” which Waldron dedicates to her father. “Proud Lion/think he knew deep inside/that I never did like/long goodbyes.” Nothing lightweight about that. Being such a knockout on both piano and vocals, it’s only fitting Waldron should have ace musicians backing her up, and bassist Miriam Sullivan, guitarist Steve Salerno and drummer Michael “T.A” Thompson are every bit her match. In fact one of the CD’s best points is the organic sound of the band, as if they’d played together for a million years. Mala Waldron appears at the Jazz Standard in New York City on March 27 for her official CD release, and at Night and Day in Brooklyn NY on June 8 as part of the Soul of the Blues series. Roberta Chevrette makes a powerful statement with the first two songs on her new CD, Miss America. The instrumental introduction to “Country Girl” establishes her and her band’s bluesgrass credentials. The song itself is a two-chord chant about a girl the singer admires – an older sister or someone in that capacity, who “has this easy/way with words…she’ll tell me little sister/would you quit your worrying/you know you can do/anything that you want” – but then comes the kicker: “and i remember back/to all those years ago/to when she tried to kill me/on the living room floor/with a pair of scissors/in her hand.” Then the song closes with a verse about “going out to the country/where i belong” and a dog in the backseat, “to the country/where we feel/complete.” No more mention of the older girl. It’s like a miniature experimental novel in a few verses. “Every Wind” is even more powerful, a drony Led Zeppelin-style folk song about a relationship going cold, which is the stuff of millions of songs but expressed with exceptional intensity here. Chevrette’s voice, not little-girlie yet usually small and childlike, soars to anguished heights on the choruses. If you’re detecting an Ani DiFranco influence, you’re not imagining it. “Your Words,” in fact, is a poem directed straight at DiFranco, acknowledging a debt. Sounds a little tiresome, I know, but something about Chevrette’s laser-focussed delivery makes it not so. Though the poem swerves into an indictment of Bush’s Iraq war, the political theme is picked up at greater length in the slightly too obvious “Long Long Day.” The minimalist, spoken-word “How Long” is a more effective protest song. And in the midst of it all, the bluegrass romp “Bear Tracks” reminds us that this singer-songwriter isn’t all lasers and ice. This CD takes a couple of listens to appreciate, but it’s well worth it. OUT AND ABOUT: Paul DeCoster (of Bobby Stewart and the Contraires) is turning into a ferocious front man, as evidenced by his show at the Underground Lounge last Saturday night. His mix of 80s pop-rock covers (Eddie Money, Corey Hart) and originals in a similar vein kept the crowd grooving until – well, until they had to quit to make way for a comedy show… Dave Isaacs, up from Nashville, knocked ’em dead at Cornelia Street Cafe last night with his blazing guitar chops and bluesy roots-rock… Last but not least, my own band, Whisperado, plays this Saturday night at Hank’s Saloon (Brooklyn’s infamous “Bucket o’ Blood”) with Coppersonic and The New Heathens. Get there early – the more you’ve drunk, the better we sound! Doris Baizley’s play Shiloh Rules is farce in the best sense of the word. With humor – including the physical kind – and high spirits, it shines a light on serious matters of culture and history. It’s an April night’s fever dream of the beasts and angels of war – specifically the American Civil War, and more precisely the women who bore water to the soldiers and nursed the injured and dying during the bloody Battle of Shiloh. Kate Weiman and Cordis Heard play veteran re-enactors, for the North and South respectively, who have each brought a new recruit to the field. As the older women’s reasons for participating are gradually revealed – each, in very different ways, goes well beyond merely being a history buff – their young protegees (Janine Kyanko and Judi Lewis Ockler) see their own, shallower motivations replaced by sometimes frighteningly transformational depths of involvement. In their most gripping scenes, these four – joined by an African-American park ranger, played by Samarra, who loses her objectivity as her grip on civic order loosens – smoothly convey the easy slippage between self-conscious role-playing and actually becoming the characters they’re portraying. 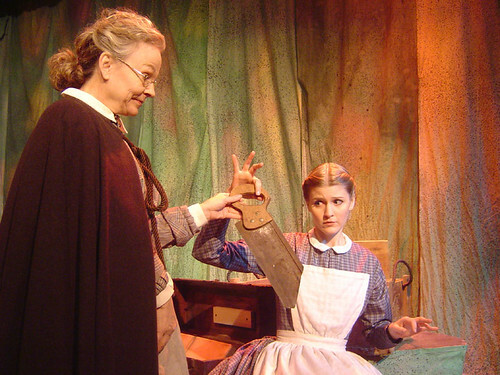 Kate Weiman as Clara and Janine Kyanko as Meg. Photo by Kila Packett. Michaela Goldhaber’s fast-paced and artful direction aid the wonderful cast in the creation of this magic. Lights, music, and especially sound help create the fog of war without any actual fog – or even soldiers (although, in a fine Shakespearean touch, the spunky LucyGale Scruggs – as perfectly named as she is played by Ockler – goes undercover as one). The script moves brightly along, vividly painting the characters as it tells their multilayered story. Rounding out the cast, Gwen Eyster sparkles as the Widow Beckwith, an unaligned capitalist who keeps a cool modern eye on the proceedings even as she plays her part in the re-enactment follies. Though there is perhaps a whiff of the Mary Sue about her, the Widow provides a grounding force that helps keep the proceedings honest. The play isn’t perfect. The way the no-nonsense Ranger Wilson gets drawn into the dialogue and action against her better judgment seems a little forced (though she does get some of the best lines). And the denouement drags as the characters spell out lessons learned and revelations that were in some cases already adequately conveyed by the preceding action, in others not really “earned” at all. But those are minor flaws in an entertaining, thought-provoking, and beautifully acted production. Through April 9 at the Gene Frankel Theatre, New York City. Tickets at Smarttix or call 212-868-4444. The annual controversy over the barring of gay groups from the New York City St. Patrick’s Day Parade has taken an added dimension this year with the ascension of Christine Quinn, who is both Irish and openly gay, to the Speakership of the City Council. Now the city’s second most powerful elected official, Quinn has decided to sit out today’s event, having tried and failed to reach a compromise with its organizing body, the Ancient Order of Hibernians. New York’s St. Patrick’s Day Parade – the oldest and largest in the world, dating back to 1762, according to Religionfacts.com – does not bar openly gay individuals, but prohibits gays from marching as organized groups under gay-themed banners. Yet, having been for many years one of the city’s biggest annual parties, the Parade can arguably be said to have outgrown its ethnic-religious origin and become a civic and partly secular event. It is certainly a march that local politicians rarely dare to snub, whatever their ethnicity or political views. Dunleavy’s very pointed analogy implies that gays are to the Irish what the Nazis were to the Jews or the KKK to blacks: murderous, genocidal enemies. Council Speaker Quinn has been politic, admirably taking the high road with her efforts at compromise and principled but measured response to its failure. I’d be seething with anger if I were gay and Irish – or gay and anything, for that matter – and a civic leader compared me to a Nazi just because of my sexual orientation. If Dunleavy didn’t mean such a thing – if he was merely making a poor analogy – I’d be interested to hear it from him. This week’s round-up demonstrates the enormous variety of what we call, for want of a better term, folk music. Fans of the acoustic guitar, get thee to thy record store and pick up one or both of these CDs from six-string master Mike Golay. Virtuosic but not flashy, soothing but not new-age precious or background-music boring (although they’ve been serving as excellent relaxing background music for me in my office), Golay’s pieces express the soul of the often taken-for-granted instrument. One can hear Hawaiian strains and Celtic touches here and there, and many of the titles are evocative or quirky (“111 Archer Avenue,” “Somewhere I Have Never Travelled,” “Baby With a Hammer”), but overall the music is a-cultural, its language the universal tongue of plucked strings. Some songs are more melodic, others more atmospheric, and Golay will throw in an unexpected bend or chromatic line in places. But there’s not a sour note to be heard. Though both CDs are thoughtful and the songs varied, the more recent “Across the Bridge” is perhaps the more contemplative of the two. It’s also longer, so if quantity is your goal and your budget allows for only one solo acoustic guitar album, go for that one. If you can’t get enough acoustic guitar, get both. You can sample the tracks at CD Baby (or iTunes, though as yet it has only Half Pint) before you buy. This style of music doesn’t get a whole lot better. Highly recommended. Although we are in a richly creative time marked by cross-pollination of musical styles and traditions, this CD stands out as something really different. In a mere 36 minutes Irina Rivkin pulls together aesthetic, emotional, political, sexual, and social justice themes into a contiguous and unique artistic statement. Despite the coffee cups in the cover photo, Rivkin’s work is very far from the “lesbian coffeehouse music” that I anticipated. Instead it’s a kind of world-folk spawned from the artist’s Russian folk-music background and acute sensitivity to personal and political injustice, and informed by a crossover-jazz sensibility a la Leonard Bernstein and a mildly experimental bent akin to that of Kate Bush or Meredith Monk. It’s all that, and it’s pretty to listen to too. The instrumental accompaniments are light to nonexistent, as Rivkin’s voice is the prime instrument here, bolstered by those of the excellent Maria Quiles and Rebecca Crump (who together with Rivkin comprise the group Making Waves). Rivkin sings her angular melodies in a voice that switches easily from soft to sharp. Where the other voices jump in, the sound becomes more universal and more exotic at the same time: discrete moments could have come as easily from a North American roots-revivalist group like the Be Good Tanyas as from an exotic, arty hitmaker like the Bulgarian Women’s Choir. Her lyrics, for the most part, manage to be both pointed and poetic. Political music is hard to pull off, especially if it’s not satirical, and, except in “Welfare-to-Work Blues,” which is musically creative and elegant but lyrically forced, Rivkin accomplishes the difficult task very well. “See Through Bush” is clever and light-handed and the more cutting thereby; the Spanish-language “Sobrevivientes” raises a fist of musical beauty against oppression; and the chantlike “Taking Our Freedom” deepens its message with hypnotically intense music while personalizing it with a dollop of family history. The non-political songs are rewarding too. Rivkin’s reflections on love and its accompanying troubles range from the imagistic (“Little Silver Packets,” “River & Volcano”) to the painfully explicit (the Outmusic Award-winning “Ya Eyo Lublu”), and, unlike most lyricists, who are at home only in one mode or the other, Rivkin can convince with words both clouded and clear. The new disc by Russ Rentler, who was an early bandmate of the folk stars John Gorka and Richard Shindell, is really three CDs in one. First, it boasts three beautiful instumentals: two traditional tunes and an original, in which Rentler’s consummate skill on a wide array of stringed instuments (too many to name, but dulcimers are prominent) takes center stage. Then there are the humorous songs, including “New Car Smell,” which has been heard on the syndicated NPR show Car Talk, and the autobiographical (and hysterical) “One-Eyed Grandma.” Finally there are thoughtful and earnest songs of love, family and the ways of the world. Rentler’s singing, and to some degree his writing, are throwbacks to the Folk Revival period of the 1950s and ’60s, specifically the plainspoken voices of artists like Oscar Brand, Pete Seeger, and the Kingston Trio, who gave audiences a sincere but somewhat whitewashed refraction of the traditional music of Appalachia and its antecedents in the British Isles. That mode is entirely out of fashion in today’s folk revival, which goes by names like Americana, Alt-Country, and Rick Rubin, and which prizes authenticity, whether native (Ralph Stanley, the Blind Boys of Alabama), studied (Old Crow Medicine Show, Alison Krauss) or transformed (Devendra Banhart). Rentler sings with much heart and little art, but after a couple of songs one gets used to it and goes with his honest and ultimately refreshing sound. There’s one big problem: clunky lyrics. Rhymes that don’t rhyme, words that stick out awkwardly from their melodies, and references that are just a wee bit off (“those times they’re a-changin'” isn’t exactly what Bob Dylan said) come too frequently to fall under the protection of artistic license. Fortunately, formal flaws are often forgiveable – and can even have a naïve charm – in funny songs, of which Rentler has several. It’s the more serious lyrics, like the love songs “Waltzing Amelia” and “Moravian Street,” that don’t trip lightly into the ears. Rentler’s previous CDs are available at the iTunes music store and presumably this one will be too once it’s processed by the great big Apple music chomper, so I’d recommend – unless you’re already a fan – that you listen over there, check out the instrumentals first, and then the rest, before laying out for the CD. I’m lucky enough to have a review copy, but iTunes gives you the choice to download the songs you like. For sure, the instrumentals are going into my iTunes library. Folk revival or not, it’s a brave new world out there for music fans; happy downloading. Skinflick does a good job aping the Foo Fighters, while Krescent 4 similarly worships Soundgarden. The UK’s The Papers aim for Neil Finn territory with their catchy pop-rock nugget “Lonely Being Beautiful,” and Anton Glamb’s “Subway” is lighthearted and amusing. Tracy Stark – an in-demand session keyboardist in New York indie circles and beyond – nails a nifty, jazzed-up adult contemporary vibe in “So Cool.” Patti Witten evokes Roseanne Cash’s smooth country-pop-rock style with the lovely, atmospheric “Black Butterfly,” and Salme Dahlstrom’s “Hello California” is crystalline, guilty-pleasure pop. OUT AND ABOUT: When is a concert a community? When it’s Meg Braun (no relation to Norine Braun) and Sharon Goldman’s fundraiser for the Summersongs non-profit adult songwriters’ camps, with which more and more top-shelf folk musicians are associating. Last night’s concert at Makor in New York City included mini-sets from about a dozen artists, among them the monstrously talented Sloan Wainwright, who writes sophisticated and captivating songs and gives a singers’ clinic every time she opens her mouth; bluesman Scott Ainslie, who held the audience spellbound with his Allman-esque voice and what may be the only song about the Vietnam War ever written for a children’s record; and – she’ll forgive me for this characterization – modern folk’s eminence grise Christine Lavin who had the crowd in stitches as she often does. Spotted in the crowd were other tour-circuit stalwarts like serious funnyman Eric Schwartz and jazz-pop original Allison Tartalia… Speaking of Allison, she’ll be performing tonight when my Soul of the Blues series continues at Night and Day in Brooklyn, along with Ian Thomas ( “Best Nostalgia-Free Revival Act of 2005,” NY Press) and Adam Payne whose soulful “sound is as big as his afro.” If you’re in the NYC area tonight, it’s a show – and a mural – not to be missed. You are currently browsing the The Bagel And The Rat blog archives for March, 2006.